The folks at National Geographic approached me about reviewing an upcoming book from master photographer Sam Abell. The book, The Life of a Photograph, draws on 40 years of fieldwork from Sam and presents readers with a unique view of his work and the life of his photographs. I was also given the great pleasure of speaking with Sam on various topics surrounding his book and photography in general (and that alone would constitute a blog post). So this article is a bit of a mix between a book review and an interview. The Life of a Photograph can be purchased directly from National Geographic or through Amazon.com. 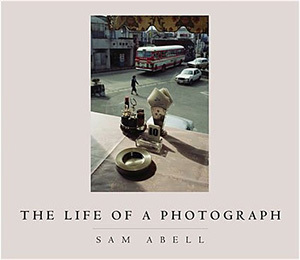 The Life of a Photograph is a collection of work from Sam Abell’s experience in the field as a National Geographic photographer. But the book isn’t about National Geographic or the stories covered by the photos — it’s about Sam Abell, his photos, and how they’ve taken on a life of their own. Sam has long been thought of as one of the most artistic photographers working for National Geographic, and this book is certainly filled with artistic photos — some having been previously published by National Geographic, and some being published for the first time ever. The book is a hearty 208 pages filled with approximately 200 color photos (except for one). Each of the 11 chapters contains thoughts and anecdotes from Sam as he attempts to answer the question “What gives a photograph a life?” Sam has identified photos that have lasted through time and talks about the reason for this. The book was carefully designed by Sam and his editor to show each photo in a most truthful manner. No images were cropped or otherwise post-processed (except to preserve the image, not fix it). The photos are given plenty of room to be enjoyed, and no image bleeds up to the edge of the page or crosses the gutter of the book. The presentation of his work was of the utmost importance to Sam during the creation of this book. One unique aspect of the book that stands out is the “two views” presentation seen on many of the pages within. Often times, a particular scene is photographed from multiple perspectives and the publication editors (such as those from National Geographic) have the task of choosing one that works best. The other photos are never seen by readers. Sam brings these photos back into the picture and opens up a whole new aspect of his work by showing “two views” from the same scene. This method of presentation has the effect of slowing down the reader because the visual relationship introduced. It also puts the reader in the shoes of the photographer and the magazine editor. All in all, the “two views” presentation is an amazing part of this book. Sam Abell began his journey into photography during his childhood mainly thanks to his Father, Thad S. Abell. One of his first life-changing experiences was brought on by a photo Sam took of his Dad with his Dad’s Rollei in 1960. The photo went on to win a prize in a national contest in 1961, and this experience helped to shape Sam’s future. He also mentions that one of his major life-changing experiences was reading a simple book on the Great Depression by Dorothea Lange in the mid-1960′s. He was inspired by Lange’s ability to document the world in an artistic fashion, and Sam’s own work through his career has followed the same example. Sam began his career with National Geographic in 1967, and has since contributed nearly 40 years of work in the field. Along the way, Sam has published several books of his own (The Photographic Life, Stay This Moment, and Seeing Gardens) in addition to several best-selling National Geographic publications (Lewis & Clark: Voyage of Discovery and The Mississippi and the Making of a Nation: From the Louisiana Purchase to Today). Today, Sam has turned more of his attention to teaching and educating via seminars across the country. He’s also spending a great deal of time editing past photos from his body of work for use in possible future publications. But he certainly hasn’t put down the camera, and he still enjoys taking on side projects in the field and photographing for his personal diary using black & white film (which is the medium that is most dear to this lifelong photographer). Though my interview with Sam Abell was quite informal, I learned a great deal from this man in just one hour. For a more formal interview with Sam, visit Photo District News for a verbatim discussion. Some books are flipped through, where the reader glances at the photos within. Others demand to be read and appreciated, but can still be knocked out in a single sitting. While few photography books require a detailed inspection and re-inspection over many sittings, The Life of a Photograph is definitely one of them. I do believe that every photographer out there can learn much from this book while being inspired by its imagery. I would even go so far as to say that it’s changed the way I look at photos. Sam’s style is incredibly quiet and simple (just like his approach to photography). Upon first glance, the photos don’t appear to be incredibly special — but then they immediately draw you into them and hit you with a profound sense of interest and meaning. Photography Books Make Great Gifts! This entry was posted in Features, Reviews and tagged book, interview, life, national geographic, photobook, photography, review, sam abell on October 20, 2008 by Brian Auer. Love your site and so glad to have found it! The tips and information you offer are very valuable to anyone I can imagine. I am photographing out of a personal passion and more for fun than anything else and can use the great tips you offer. Good to know about this book too! Thanks so much Evita! It sounds like you fit right in with the rest of the community here — we’re mostly in that group of “personal passion” photographers. And if you’re at all interested in the book, I’d suggest grabbing a copy soon. Sam’s last book is now selling for nearly $300 (used) on Amazon. I’d expect this one to be in a similar situation a few years from now. Wow that is quite an honor to review the book and speak with Sam Abell. He is one of my favorite photographers ever and definitely someone that has influenced the way I pursue photography. Yes, I am very humbled to have spoken with him. He’s very down to Earth and you can just tell by the way he speaks that he’s truly a master of photography and art. Well thanks Emma! Glad to have you here! thanks for the article… i think Sam Abell is brilliant..i love photography and i wanna learn a lot techniques and styles to take nice pics.. I have realized there are terrific comparison exercises presented in The Life of a Photograph. For example, when faced with two views of a cab in a Santorni street scene, do you choose the image on the left that includes a towering bust of a historical figure or the frame on the right where the roof of the taxi appears like a fresh sheet of ice? Out of four shots taken from a Japanese bullet train window, are the photographs where Mt. Fuji is captured intact superior to one with the mountain obscured by a steel structure? The book provides a semester of such discussions. I love that Abell book. It was one of the first “garden photography” books I bought and I devoured it. Thanks for reminding me about it; tonight I will take it off the shelf and look through it again, and maybe it will inspire me to find some new “garden views” of my own.